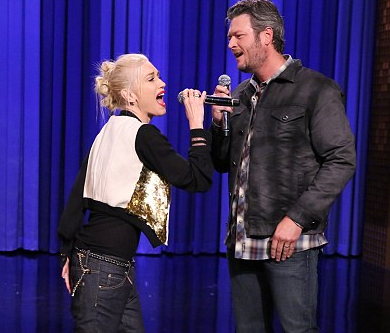 -These Blake Shelton and Gwen Stefani reports are just the result of a weird confluence of wishful thinking/coincidental timing, right? RIGHT?!?!? –Taylor Swift‘s reaction to the Hollywood Reporter tweeting about her winning an Emmy was pretty adorabs. -Did Ben Affleck have to change his phone number to get away from his nanny? HA! –Susan Sarandon explained her trip to Burning Man and her love of nail guns to a bemused Jimmy Kimmel last night. -Not only do Canadians still get to watch the new Hulu-produced season of The Mindy Project on an actual TV network starting Nov 5, each episode will be available on Citytv.com at noon on Wednesdays, beginning Sept. 16. God save the Queen! –Ellen DeGeneres crushed Jimmy Fallon in the latest round of Lip Sync Battle. –Fallon rebounded by pulling out some classics in last night’s History Of Rap with Justin Timberlake. -Also, here’s Fallon and Timberlake dancing in the stands to Beyonce on the arena screen at the US Open. –Tina Fey showed the world the best DubSmash ever, featuring Maya Rudolph. -After yesterday’s pro-Jon Hamm story in Us Weekly, People is giving Jennifer Westfeldt‘s camp a boost. -Once again, a CW show seems to be the only new fall series TV critics are really pulling for. -At this point, announcing you have a crush on Amy Schumer is like announcing you like to breathe. -I broke my Fall TV “no promos/no spoilers” pledge (which, btw, has been REALLY hard. Why ya gotta release so many tempting trailers, Arrow?!) to watch the Netflix promo for Jessica Jones because A) Twitter warned me that it doesn’t contain any actual footage, and B) I adore Krysten Ritter. It’ll premiere on Nov. 20 and be 13 episodes. -Here’s the trailer for the Sundance hit James White, starring Christopher Abbott, Cynthia Nixon and Kid Cudi.